The restaurant in Long Street has been there since 2006; in 2010 owner Ed Saunders opened Knife in Century City, and this year he launched the pop-up Spoon. Coincidentally, these have all been Fifa World Cup years but we cannot ascertain what happened in 2014. “So many people have been asking for so long when I was going to do the spoon,” he comments, so now we finally have the full set of cutlery. Fork was one of the first tapas-style restaurants in Cape Town, something which has grown into a trend which shows no signs of fading away. I love the concept – sometimes called small plates – because it means you get the chance to try a few different dishes instead of just one starter or main course. Apparently it’s also designed for sharing, if you can accept that other people will be sticking their fork (or spoon) into your favourite plate or bowl. The idea for Fork is that the food can be scooped up with one utensil and carried to your mouth. Knife is where you employ that one for your steaks and grills, and Spoon – as I’m sure you’ve figured out already – is easy-eating from a bowl. Launched as a pop-up, Spoon is inside Fork and you can order from one or both of the menus, whether you sit downstairs, or upstairs. The Spoon menu is small and displayed on a chalkboard. Prices begin at R60 but if you go there during the day, they’re all R50 from noon till 6pm. Ed had me around for a catch-up last week, so I no longer have to say I haven’t been there for ages, and we spent a leisurely few hours chatting over wine and some of the bowls. We began with the light and silky gnocchi which sits in a cream sauce thick with parmesan, studded with walnuts, and rocket. Oh my word, it was wonderful. Like eye-rollingly good. Next, we had the mussel and sweetcorn risotto, which was just as good, the little kernels of corn popping sweetly in the mouth, providing texture against the rice. At this point we were actually sharing because I generally don’t do heavy carbs, but life is too short not to make exceptions now and again, and I regret nothing (I seldom do). 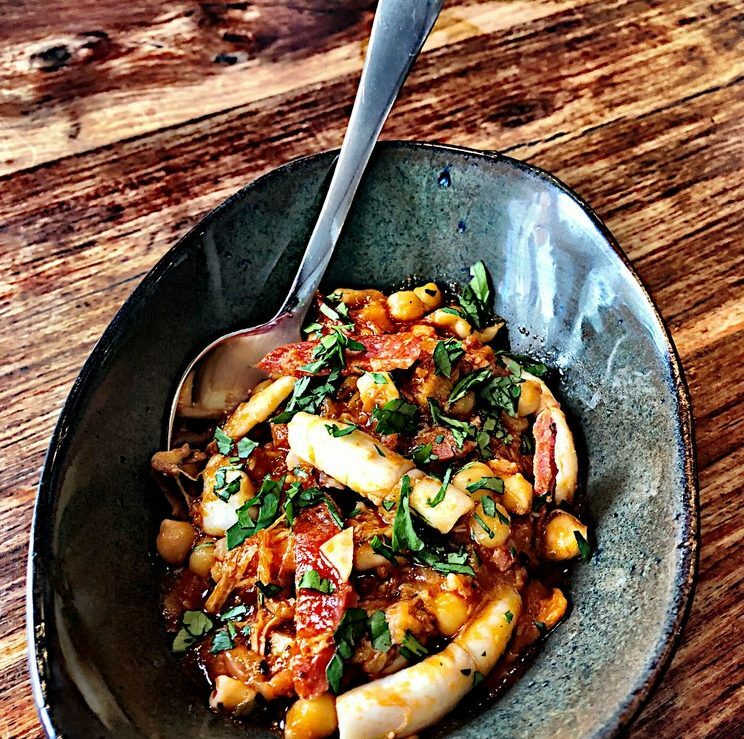 But by the time we got to the third bowl, which was Catalan stew with pork belly, chorizo, chickpeas and calamari in a rich tomato sauce, I inhaled it all before Ed had a chance. So, so delicious. For dessert, I tried the pears poached in red wine, served on top of oat crumble, with a scoop of mascarpone, which worked well on every level. Other bowls include ostrich goulash and Cape Malay cob (kabeljou) curry, and for dessert, a lime and coconut sago pudding. The bowls themselves were all individually made by Clay Café in Hout Bay, in a move which proudly supports local business. * Fork – and Spoon – is/are at 84 Long Street in the CBD and open for lunch and dinner Mondays to Saturdays. The kitchen will serve you any time from noon until 11pm, so you can pop in for a quickie and a glass of wine when you’re passing by; or gather a group of friends and make an event of it. It’s a great option for before or after the theatre or a movie, something which can sometimes be so challenging. For more information, call 021 424 6334/021 424 6098; or visit to www.fork-restaurants.co.za.